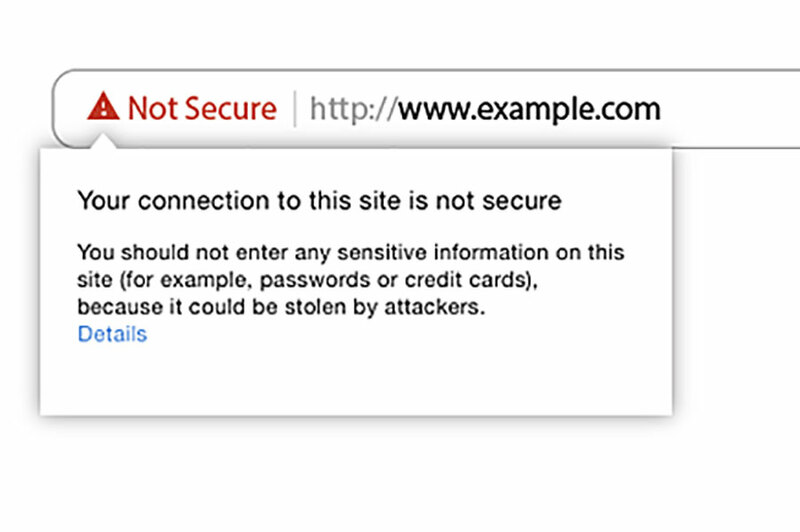 If your website address uses the label http:// Google will soon display a red security notice that the site is insecure. The warning will become more prominent as time goes on, eventually flagging all web pages without extra security encryption. Eventually, we plan to label all HTTP pages as non-secure, and change the HTTP security indicator to the red triangle that we use for broken HTTPS,” Chrome Security Team Emily Schechter said. Hosting companies are making it easy to add an extra layer of security by installing a “Secure Socket Layer” (SSL) Certificate. Currently, the web has more than 50 percent of its traffic encrypted, so at this point your site may be a “late adopter” in danger of getting flagged as insecure. WordPress is the most popular publishing platform on the web, powering almost 30 percent of all websites. If you have a WordPress site and have any kind of contact form set up, that page may already be flagged by Google as a security threat in the newest version of Google Chrome v.62, just released in October. Soon, that warning will extend to all your other pages, creating the impression that your site isn’t safe and should be avoided. • You need an SSL certificate to enable https on your site. This sets up a more secure connection between your site and visitors, preventing “man-in-the-middle attacks” and verifying site ownership. Benefit: Visitors see you’re protecting their sensitive information and you’re less likely to suffer a site hack. • Be sure to purchase the right kind of certificate. A single certificate is issued for one domain name, but there are multi-domain and wildcard certificates as well. Benefit: Your business is verified as the owner of the domain name. • Verify that your HTTPS pages can be crawled and indexed by Google to maintain site rankings. Check with your webmaster (if you have one) about securing your site. If you don’t have an “official” webmaster, contact your web designer—the person who set up your site in the first place. That person should be able to help you choose the right certificate and get it installed. Don’t hesitate to ensure your site’s credibility. The clock is ticking and all too soon you’ll see the dreaded warning sign on your site telling visitors your site is not secure. Not sure about resolving this issue soon? I love to help people solve technical problems. Just call Nancy at 414.771.8906 or email nancy@cavanaughinteractive.biz.